Ultimate show-off puds that don’t hold back. Grab a spoon, dip in and devour their luscious layers of flavour and boozy secrets within. Recipes by Annie Bell. Have ready a trifle bowl about 20cm across and 8cm deep. Snip 6 gelatine leaves into strips, soak them in a little cold water in a large bowl for 5 minutes, then drain. Sit the bowl over a pan containing a little simmering water, pour about 4 tablespoons of boiling water over the soaked gelatine and gently stir to dissolve. 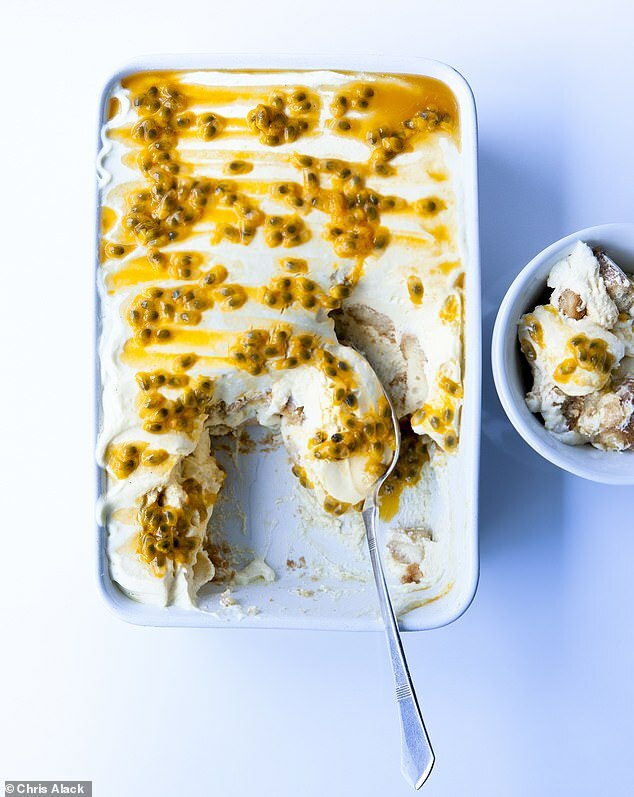 In a food processor, whiz together 500g zero per cent fat Greek yoghurt, 200g coconut yoghurt, 450g mango flesh (from about 3 mangoes), the finely grated zest of 1 lemon and 2 tsp lemon juice until smooth. 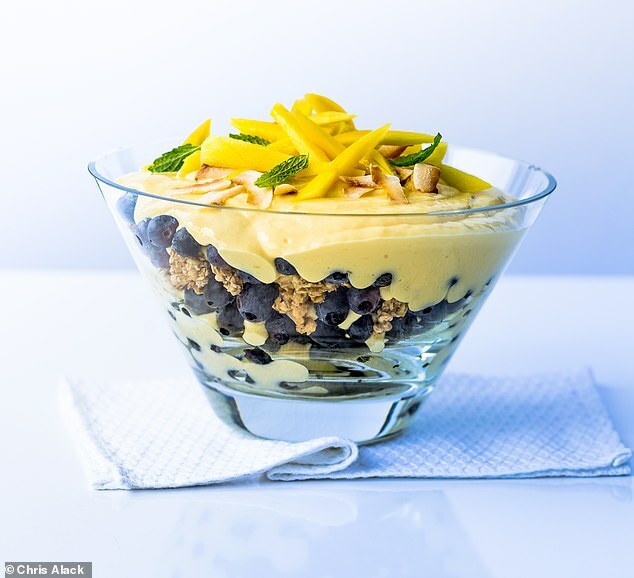 Add stevia sweetener (for example Sukrin) to taste and transfer to a large bowl.Stir about 4 tablespoons of the mango yoghurt (one at a time) into the gelatine mixture, then stir this back in with the remainder. Cover and chill for 2-3 hours until lightly set or the consistency of whipped cream (start checking after 2 hours). To assemble, you’ll need 400g blueberries and 100g good quality granola. Scatter half the blueberries over the base of the trifle bowl followed by half the granola. Smooth half the mango yoghurt mixture on top and then repeat the layers. Cover and chill for several hours or overnight until set. Shortly before serving, decorate with dried or fresh mango, toasted coconut shavings and a few tiny mint leaves, if you like. For the custard, whisk the egg yolks and icing sugar together in a medium nonstick pan until smooth, then whisk in the flour a third at a time until you have a thick, creamy paste. Bring the milk to the boil in a small pan then, starting a little at a time, gradually whisk it into the egg yolk mixture until combined. Return the pan to a low heat and cook for a few minutes, stirring vigorously with a wooden spoon until it starts to thicken. Don’t let it boil, but the odd bubble will ensure it’s hot enough to thicken properly. Cook for a few minutes longer, again stirring constantly (give it a quick whisk if necessary to disperse any lumps and produce a nice smooth custard). Remove from the heat, stir in the vanilla, strain through a sieve into a large bowl, cover with clingfilm and leave to cool. 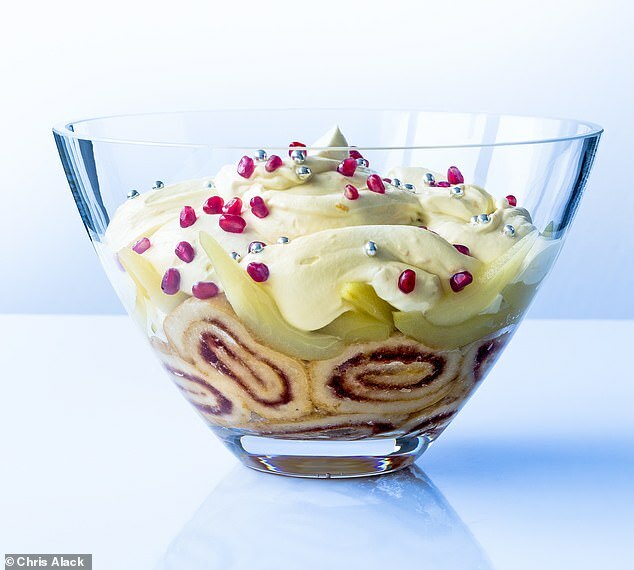 Arrange the sliced panettone over the base of the trifle bowl. Drizzle over the whisky mixture. Scatter over the oranges. Give the custard a stir and smooth over the oranges. Whisk the cream in a large bowl until it forms soft, fluffy peaks. 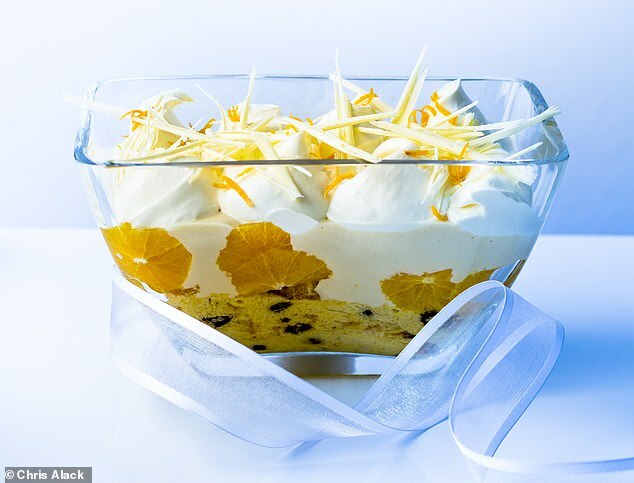 Smooth this on top of the trifle and scatter with the chocolate shavings and orange zest. Chill for several hours before loosely covering. It will keep well for a couple of days. Arrange the trifle sponges in the base of the bowl and sprinkle over the sherry. For the chestnut cream, place the chocolate and butter in a bowl set over a pan of simmering water and allow to melt, stirring now and again until smooth. Remove the bowl from the heat and leave the mixture to cool to room temperature. Place the chestnut purée, sugar, cream and vanilla extract in the bowl of a food processor and whiz until creamy, then add the chocolate and butter mixture and whiz again until you have a silky purée. Smooth this over the sponges. For the mousse, separate the eggs. Whisk the egg yolks and sugar in a large bowl, then beat in the mascarpone and vanilla extract. Whip the egg whites until stiff in another large bowl using an electric whisk and fold into the mascarpone mixture. Smooth this over the top of the chestnut purée, cover and chill for several hours, or overnight. It will keep well for a couple of days. Before serving decorate with your choice of finishes. Prepare the pears up to a day ahead. Place the pear ingredients except the fruit in a medium pan, bring to the boil and simmer briefly until dissolved into a light syrup. Peel and slice the pears thinly, discarding the cores. Add the pears to the syrup, submerging them, bring back to a simmer, cover and poach over a low heat for 5 minutes. Leave to cool then cover and chill overnight, allowing the pears to steep with the spices. When ready to assemble the trifle, drain the pears, discarding the syrup and flavourings. Line the sides of the trifle bowl with slices of swiss roll cut 2cm thick, placed upright like wheels, then slice the remainder about 3.5cm thick and arrange in the base of the bowl. Splash the sherry over. Spoon the drained pears over and around the swiss roll slices. Whisk together the syllabub ingredients, except the cream, in a large bowl. Slowly whisk in the cream in a thin stream, continuing to whisk until you have a light and fluffy syllabub, which should be the consistency of softly whipped cream. Smooth this over the trifle. Cover with clingfilm without touching the syllabub and chill overnight. The syllabub will firm up and the juices will soak in. Shortly before serving, decorate with pomegranate seeds and silver decorations of your choice. Have ready a shallow serving dish about 30cm long and of 2-litre capacity. Separate 3 medium free-range eggs. Whisk the yolks in a large bowl with 50g golden caster sugar, the finely grated zest of 1 lemon and 1 tsp vanilla bean paste or extract. Using a wooden spoon, beat in 500g mascarpone until smooth. In another large bowl, whisk the egg whites until stiff. Fold these into the mascarpone mixture, half at a time. Spread a tablespoon or two of the mixture over the base of the serving dish. Have ready about 250g sponge fingers. In a shallow bowl, combine 120ml limoncello (or alternatively an orange liqueur of your choice) with 225ml cooled matcha tea. One by one, dip the sponge fingers into the limoncello mixture until they just start to yield between your fingers, but without soaking them. As you go, arrange a single layer of dipped sponge fingers in the serving dish. Smooth over just under half the remaining mascarpone mixture. Repeat with the remaining ingredients so you have two layers each of sponge and mascarpone mixture. Smooth the surface with a palette knife. Cover and chill for at least 2 hours, or overnight. Shortly before serving, drizzle over the seeds and juice from 3 passionfruit. Have ready a trifle bowl about 20cm across and minimum 6cm deep (or make individual servings). Snip 5 gelatine leaves into strips, soak them in a little cold water in a large bowl for 5 minutes, then drain. Sit the bowl over a pan containing a little simmering water, pour 4 tablespoons of boiling water over the soaked gelatine and gently stir to dissolve. Purée 600g raspberries (or use hulled strawberries in season if you prefer) in a blender with 1 tbsp lemon juice. Add stevia sweetener (for example Sukrin) to taste. Sieve the purée and return to the blender. Stir about 4 tablespoons of purée (one tablespoon at a time) into the gelatine mixture, then pour this back into the blender and give everything a quick whiz to combine. Pour this into the trifle bowl and chill for half a day or overnight until set. 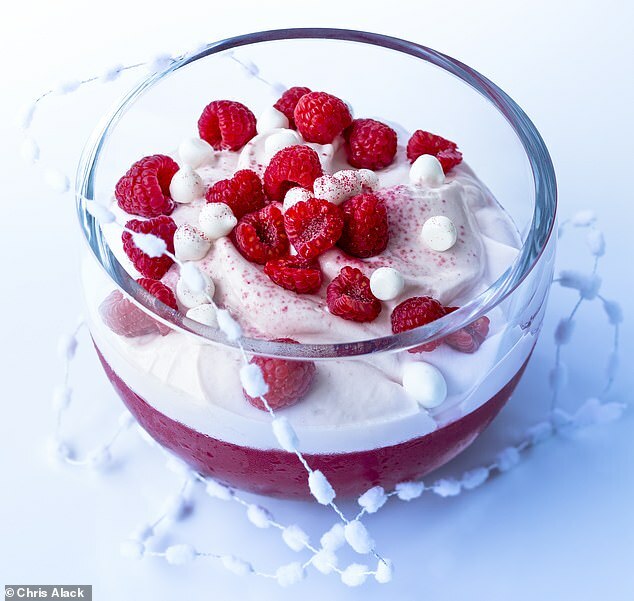 Whiz 500g quark with 25g crème fraîche and 1 heaped tsp freeze-dried raspberry powder in a food processor until smooth, add stevia sweetener to taste, then smooth the snowy cream over the jelly. Cover and chill for up to a couple of days. Shortly before serving, scatter over 200g extra raspberries and some shop-bought mini meringues and dust with extra raspberry powder and icing sugar, if wished. 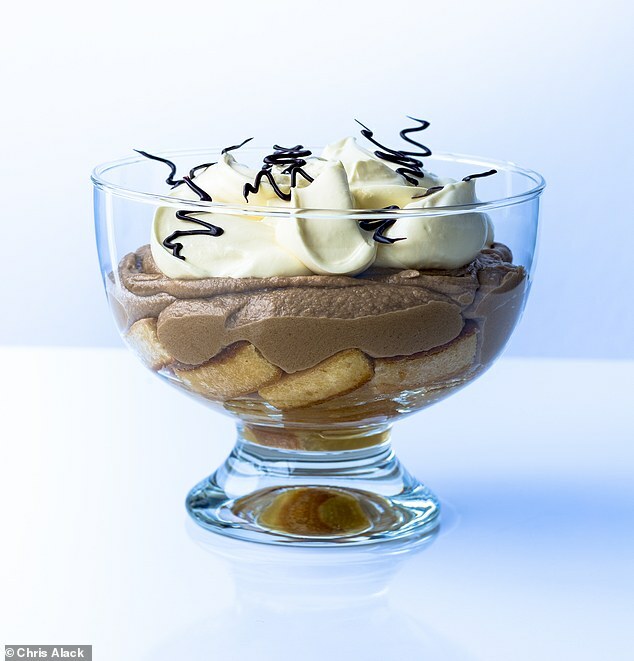 For the mousse, gently melt the dark chocolate and allow to cool to room temperature. In a small pan, bring the orange juice to the boil with the dates, mashing them in and simmering for a minute or two until you have a thick paste. Transfer this to a food processor and allow to cool. Add the egg yolks, whiz to a purée, then trickle in the melted chocolate and cream (the mixture will be sticky). Scrape this into a large bowl. In another large bowl, whisk the egg whites to fluffy peaks. Add half to the chocolate mixture, beat until smooth using a wooden spoon, then carefully fold in the remaining egg whites in two goes until combined. Roughly break up the madeleines. Scatter these over the base of the trifle bowl followed by the hazelnuts. Drizzle over the rum mixture. Smooth the chocolate mousse on top, cover and chill for a couple of hours. 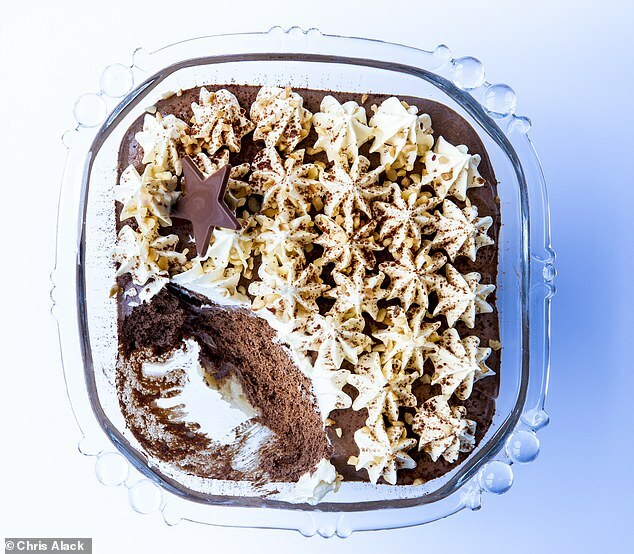 If not piping the cream decoratively as in the picture, whisk 150ml in a medium bowl until it forms fluffy but firm peaks and spoon it over the chocolate mousse. Alternatively increase the cream to 250ml and whip and pipe it in rosettes or to your taste. Finish with chopped hazelnuts and chocolate shavings. Return to the fridge for another couple of hours before covering with clingfilm. Dust with icing sugar or cocoa, if wished. The trifle will be good for a couple of days.